I know...Christmas talk already? It's too soon! LOL! However, it's never too soon to grab some holiday themed stamps for 15% off!! Sweet 'n Sassy is holding a Christmas in July sale from now through Sunday. ALL Christmas stamp sets will be 15% off! Use code CMASJULY to receive your discount. My card features the Joy to the World stamp set, which includes this main image, along with another image and three sentiments. (You can see a photo of the entire stamp set at the end of the post) I also used a lot of words from a number of different sets, I'll list them at the end of the post, to create the background. Once my coloring was completed, I cut a mask for the image, and added the background colors using Distress Inks and a blending tool. Water and a white paint pen added clouds and stars to the night sky. The main image includes a tiny heart on the manger, but I opted to add a Wendy Vecchi mat mini heart, colored with Distress Inks and covered with just a hint of glitter. 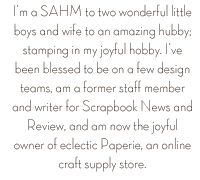 The background was created by stamping a whole lotta words and sentiments onto a piece of cork, which I found while digging through my stash looking for a designer paper to use on my card. I thought the cork was a fun and different element to use on a card and I loved the look of the black text on the background. Text...nothing beats different letter styles and sizes...it makes me happy. My entire piece was mounted onto a black card base. And there you have today's Christmas card! You will be able to find all of the team participant blogs at the end of this post. Simply click on their name and you will be taken to their blog. The list will be on each person's blog, so no need to hit the back button. Just look for the next blog in the line-up and off you go! Please be sure to leave the girls some love along the way. We will be drawing a winner from all of the blog comments and that person will receive a FREE Christmas stamp set (in stock) of their choosing from our line! And don't forget to check out the great sale at Sweet 'n Sassy! Hi all, and welcome to the final Sweet 'n Sassy release for July! 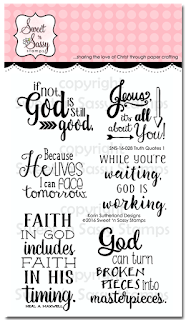 These two sets might just be my favorites this month as both can be used in so many ways and are also perfect for Bible journaling. My first card, shown above, was created with the new My Creator stamp set. 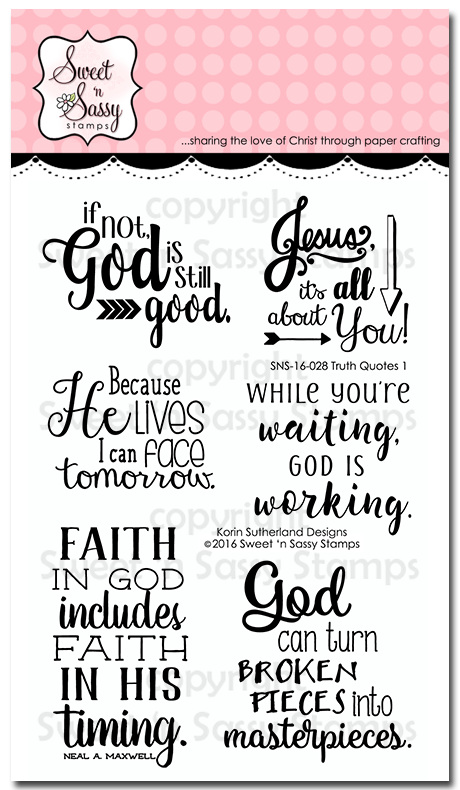 This new stamp set includes 20 images and sentiments and retails for $15.95. My second card features the All Your Heart stamp set, along with some quick and easy water coloring. The stamp set is a word set and includes 11 stamps, two which are decorative images. I started this card by water coloring a panel. I used Distress Inks for my water coloring; just use the ink pad to apply a little ink to a non-stick craft sheet, and pick up the ink with a wet brush. I also applied water to the water color paper panel before adding color. This allows the color to move more freely and blend. I applied two layers of color for this card, dying in between layers. This gives the background a little more visual interest and texture. I hope you enjoyed today's cards! Be sure to visit the links, listed below, to place your order for one or both of these sets! Hi friends! 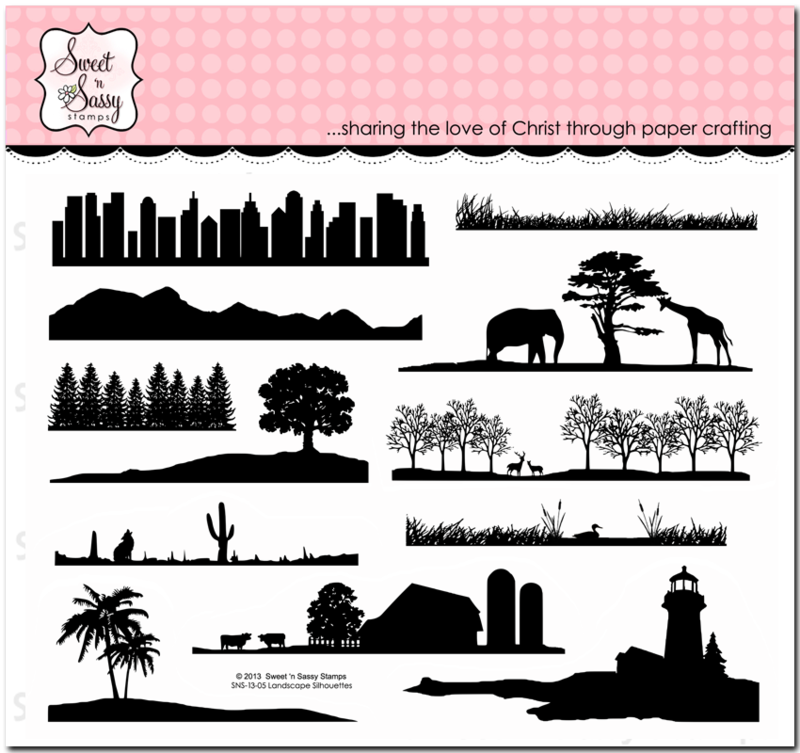 Welcome to the latest release from Sweet 'n Sassy Stamps! Today the stamp set, Truth Quotes 1 has been announced and I'm sharing a shaker card that I created using one of the sentiments from the stamp set. I cut a piece of 3"x4" cardstock and created the sunset with Distress Ink.I used a large circle to create the sun. You can see a video demonstrating a similar look here. The bird, from the Nature Silhouettes stamp set, was stamped directly onto the sunset paper. The lighthouse, from the Landscape Silhouettes stamp set, was stamped on a separate piece of paper and fussy cut. I added foam tape around the entire sunset piece, attach the lighthouse to the bottom, and added my shaker card fillings, glitter and mica flakes from Prima. I set that piece aside and stamped the sentiment, from the new Truth Quotes 1 stamp set, on the pre-cut acetate. I stamped the sentiment in Archival Ink. The acetate was attached to the top of the shaker card. The frame was created with two Spellbinders dies; one nestled inside another creates a perfect frame! My card base was created using a stitch die from Simon Says, and I added clouds using a hand cut cloud mask and Distress Ink. The last step was to assemble! I hope you enjoyed today's card! 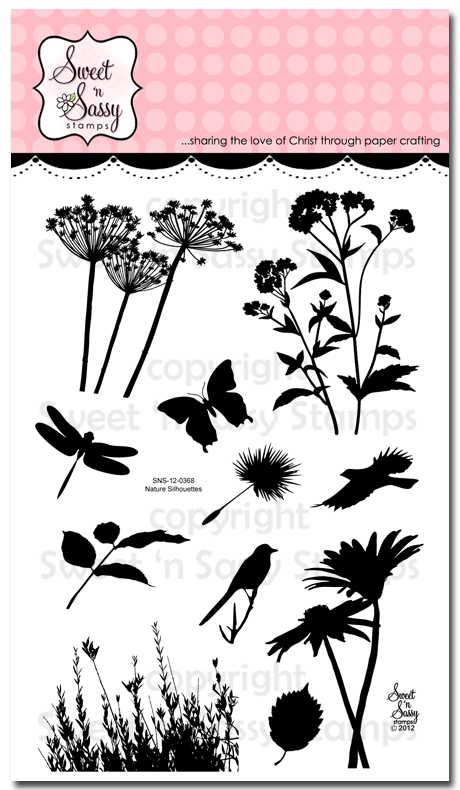 Be sure to head over to the Sweet 'n Sassy shop to take a look around at all of the beautiful stamp sets! Here's a look at the sets I used to create my card, along with a close up on the shaker card. Happy July 4th!! 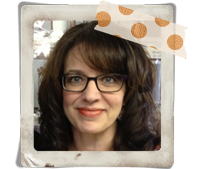 Today I'm excited to share two news bits...First, I've rejoined the Sweet 'n Sassy Stamps design team! I've been with the team for years now, but stepped down after our CT move. Now that we're back home, and live has kind of slowed down (not really), I decided to pick up some stamps again. Second, Sweet 'n Sassy just released a brand new stamp set, Summer Fun Winnie. This sweet set, perfect for all your patriotic themed cards, features 25 images and sentiments. The set measured 6"x4" and retails for $15.95. My card started with a kraft base and a whole lotta kraft stars! The stars were die cut using the Stars Die Set, which includes four different sized stars. I used a Xyron machine to turn the stars into stickers, which made adhering them to the card base super quick and easy. The Winnie image was stamped on Strathmore Mixed Media paper and colored with Distress Markers and a water brush. (I scribble the marker color on a non-stick craft sheet and then use the water brush to pick up the color and apply to the image.) I added a few highlights to Winnie before cutting her out. The banner is a separate image and the word celebrate, also a separate image, was created to perfectly fit inside the banner...cool, huh? And the banner fits inside Winnie's hands! The sentiment tag was also die cut from kraft cardstock, and I stamped the words Independence Day in Archival Ink. The tiny banner, stamped on the sentiment tag, is also in the new set. Lots of different design options with this new set! Once everything was stamped, cut, and colored I mounted the pieces onto a piece of checkered designer paper and added a few rhinestones. The full stamp set is shown below. Hope you enjoyed today's card!